Insurance companies and their legal departments will go to great lengths to discredit plaintiffs who sue them for personal injury claims to avoid paying out fair settlements. These types of strategies are well documented in many cases, including class action lawsuits, across the United States. Victims of car accidents that suffer back injuries as a result of the collision often find themselves in long and painful recovery periods and on top of that, have to deal with insurance companies that try everything to avoid paying their fair share. That’s why it’s imperative that you have an experienced lawyer and a doctor who can work together to make sure you’re fairly compensated for your injuries. Degenerative disc disease is a chronic condition of the discs between vertebrae that lose their cushioning, and can cause herniation. While it is medically referred to as disease, in reality it is really just part of the aging process. Like a lot of problems in life, everyone is affected differently but every human body degenerates over time. This type of problem typically occurs in one of two ways — when the outer layer of the disc becomes cracked and rigid and the fluid from the disc bulges out, and when the loss of water molecules in the nucleus reduces the space between the vertebrae and puts pressure on other joints in the spinal cord. In response to the aging process, the body may develop bone spurs that compress the spinal cord. Degenerative disc disease affects more than 3 million Americans every year. While the majority of these cases are related to aging, there are also a number of instances where trauma from an accident can cause a person to have a worsening condition or causes a condition to become painful when it wasn’t a problem before the collision. The impact of a serious car accident can put a lot of pressure on your back and spine, and if you have any previous back injuries or conditions, it can significantly worsen a pre-existing condition. But wait, don’t insurance companies refuse to pay when there’s evidence of a pre-existing condition? How will this affect your settlement? How can you prove the accident made your condition worse? And what if you had no symptoms prior to the accident but your doctor says you likely had the early signs of degenerative disc disease before the accident? 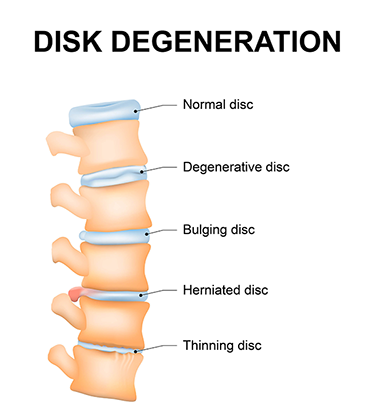 Your degenerative disc disease settlement will depend on a variety of factors, one being the severity of the accident and how your condition is treated. Treatment options include therapy to surgery depending on the nature of your injury. An X-Ray, CT scan or an MRI can demonstrate whether you have any pre-existing degenerative condition. Even if you were unaware of the condition, these tests may show a pre-existing condition that the insurance company will likely try to use to reduce its exposure regarding your collision. The existence of a pre-existing condition does not mean you are not entitled to compensation for your injuries because the law requires you to take the person as he or she is. Meaning, you are entitled to damages for any worsening of your condition. One of the keys to a successful settlement in this situation is proving that you would not have otherwise suffered the pain or incurred the level of medical treatment you received had it not been for the accident. So how much can I expect from my degenerative disc disease settlement? Personal injury settlements involving degenerative disc disease can be long and drawn-out processes, and the settlements can range considerably depending on a number of factors. A trusted lawyer with experience in degenerative disc disease settlements can help make sure you receive fair compensation. The key to degenerative disc disease settlements is proving that the accident caused the pain and prompted the medical treatment, even if there was a pre-existing condition. If this is the case, you are likely to get a more significant settlement. Because of the nature of this injury, many insurance company attorneys will see this type of injury as a great opportunity to discredit your claim. What other damages can I claim for my degenerative disc settlement? Compensation for personal injury settlements typically include economic and noneconomic damages, and, in some cases, punitive damages can be awarded. Economic damages in personal injury claims are financial losses that you may suffer as a result of your accident, such as lost wages from not being able to work for an extended period of time. A reduction in wage-earning capacity in the past and future should also be considered. For example, if you held a job that required the constant use of your back, chances are you may not be able to work that job again, or until you’ve fully recovered. That loss of earning capacity can often be factored into your settlement. Other economic damages can include the cost of transportation, child care, and other services that you had to pay for as a result of the accident. Economic damages also include the cost of your medical bills, and can sometimes include future or anticipated medical bills. Non-economic damages provide compensation for non-financial damages, such as your pain and suffering. Other type of economic damages for this type of injury can include mental anguish and disfigurement. Punitive damages, or exemplary damages, are seldom awarded, and in fact, are very hard to get under Texas law, but should not be ruled out in cases of severe or gross negligence. These are cases in which the person or company responsible for the accident acted in such a negligent and malicious way that additional compensation is merited. Even in these types of incidents, most punitive damages can only be awarded after the case goes through a full civil trial. Punitive damages are awarded to prevent the individual, company and others from acting in a similar way again. Comparative, or contributory negligence, can also help determine the amount of your spinal fusion surgery settlement. In most states, you may be able to recover a settlement if the other party was at least 50 percent or 51 percent responsible for causing the accident. In Texas, comparative negligence is used. This law limits the amount you can recover in a personal injury lawsuit. To determine comparative negligence, Texas uses a formula called proportionate responsibility, in which the amount of a settlement awarded by a jury decreases by the percentage that the winning party was at fault. For example, if you were found 40 percent to blame for the accident, you would receive 60 percent of the jury’s award. However, in Texas, if you are found to be more than 51 percent responsible for the accident, you can’t recover anything. After your accident, you should also make sure to follow the instructions and medical recommendations of your doctor, such as physical therapy and follow-up visits. If you don’t follow the doctor’s advice, your compensation could be reduced because you neglected to properly care for your injuries as instructed. We can help you understand how these types of damages work and ensure you receive a fair settlement for your degenerative disc disease settlement.